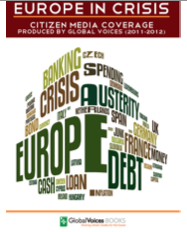 The Global Voices first e-book (July 2012) is a collection of best material from the wealth of social conversation, participation and mobilization boosted by citizens going through the tough times of austerity in the Old Continent and beyond. We hand-picked and assembled the best posts from the on-going special coverage provided by our International team of dedicated citizen-reporters. To learn more about each format and their device-compatibility, check here for Mobipocket and here for the ePub. Many thanks to the contributors and to Global Voices for this incredible, free resource.